The next Autocross event is scheduled for 6th Nov. The arena is the same old tiny track which previously was a parking lot at Sea view, Clifton, Karachi. You can’t see the cars at their full potential; the track is so tiny with curves so hard that the cars can’t develop enough speed to make a spectacular viewing. Thrill isn’t there and motor sports are all about thrill. At few curves the cars have to break down so hard from say 70 KMH to 10-20KMH to pass the curve neatly. But this is the best one’s achieved with limited resources. However, there is someone hiding a potential beauty from the public of Pakistan. They are the same folks who wasted millions of Rupees on advertising for launching their newest car, which they could have used a lot more sensibly by providing a playground at their very own assembling facility for their newest car they had launched. Apparently, the shortage of common-sense overwhelmed the geniuses and instead they ran an expensive launch campaign at a time where nobody is sure about anybody’s future. Anyways, the following picture is taken from Google Satellite and shows atleast mile long roads, one forward and the other reverse. 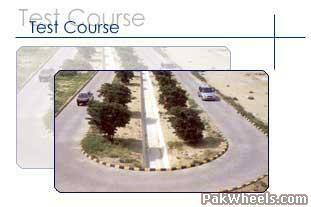 These roads were once described on Pak Suzuki’s website as their test course, but now, abandoned or not, they took it off from their website, and, as we can see from these images that if Pak Suzuki have any simplest form of loyalty with the people of Pakistan, they can provide a wondrous Racing Track to the people as it is or make it thrilling by adding a few curves. Even though those roads are just plain straight with a tiny stretch going out then coming back instantly, but, if modified a bit, these tracks can provide you with the best of live motor sports driving and viewing pleasure that you could only dream or dream to do abroad. For how long will Pak Suzuki keep us deprived of this treasure they have in their back yard? And how long would we have to tell them better, more efficient marketing ideas that are cheap and can live on its own for decades to come. Modify the test track and head over to PakWheels forums and show us how cool and thrilling you can make Pak Suzuki’s test track with the help of above image.